This DVD is the essential educational tool for shop owners and tattoo artists alike. awareness of the potential illnesses associated with the tattoo process and the precautions necessary to eliminate cross contamination. Chapters included are; Preventative Measures - Sterilization - Station Prep - Bio-Room & Station Tear Down. A guide to realism by joshua carlton! 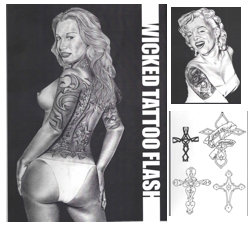 This book is by one of the leading artists in realistic tattooing, the book focuses on creating high quality realistic tattoos. It goes in depth showing techniques of tuning your machine, selecting and editing proper reference, creating and applying stencils for realism, advanced needle configurations - how to use them and how to make them, finding shapes and values, creating portraits, using large magnums, how to use realistic color and flash. Volume 2 goes even deeper into what is needed to create true realism on skin & more in depth discussion on machines and shows you easy ways to tune them for the smoothest blends possible. Also features info pertaining to; Exact spring guages and and machine speeds, Photoshop tips for making your reference the best it can be, plus watch Joshua do this Chimp tattoo from start to finish and see special techniques used to achieve realistic results. Filmed in real time, this 3 disk DVD set is over 3 hours long. Watch and learn while Joshua does a full color allaprima realism piece (all at once) from start to finish and explains his new techniques as he does the tattoo. Joshua's techniques are very different and need to be seen to be understood. This beautiful Full Color on Glossy Book takes you into the shops of ten well-known and very experienced artists spread across the country for both, a how-to and a photo-intense look at the world of tattoos. Includes interviews with the artists that explain not only how they do what they do, but their personal preference for materials and methods. Detailed photo sequences follow each artist through a tattoo project. From customer concept, to sketch, outline, and the finished colorful design. The chapters document not only the techniques, but also the inks and tools used during each step of the process. Whether you're learning the Art of Tattooing or just fascinated by the world of Tattoos, this 144 page, illustrated with over 400 color images, is sure to provide a wealth of information. Size: Height~11", Width~8.5", Thickness~0.3", Weight~3 oz. This beautiful Full Color on Glossy Book entitled "From Idea To Ink", is an indispensable resource for tattoo artists and collectors alike. The book traces the origin of a tattoo from its initial inception through the process of design and finally implementation in the hands of talented artists like Amanda Wachob of Blue Moon Tattoo in Buffalo, New York. With an abundance of colorful images and insightful text, this book provides a first-hand look at the stages a custom client experiences in getting the tattoo of his or her dreams. From understanding this process and reviewing the different styles of art available, Tattoo: From Idea to Ink, offers artwork, artists, and suggestions for anyone looking for that perfect piece of art. In addition to a full section filled with original artwork from master tattooists, the book features work by industry legends like Brandon Bond, Sarah Peacock, Zsolt Sarkozi, Shannon Schober, Mario Desa, Corey Rogers, Josh Woods, Nate Beavers, and many more. Size: Height~11", Width~8.5", Thickness~0.3", Weight~3 oz. Whether you are new to the trade or an old hand this handbook could be invaluable to you. One tip from this book could save you years of frustration. Book is PACKED with information plus includes dozens of Graphics/Photos. NOTE: Out of all of our instructional books we RECOMMEND this one the most! Size: Height~13", Width~8.5", Thickness~0.5", Weight~4.0 oz. 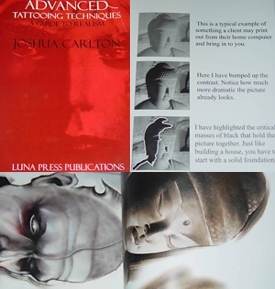 Book Description: Secrets of Tattooing is a breakthrough in the tattooing industry. The information contained in this book has never been available before. Rediscover the "lost secrets" of tattooing. Learn how and why a Tattoo Machine runs the way it does, and how to make it run the way you want it to. With Secrets of Tattooing you will also learn about Machine Frames, Frame Geometry, Tattoo Needles, Ink Mixing and more! Secrets of Tattooing will help you bring your tattooing to the next level! Size: Height~10", Width~7", Thickness~1.5", Weight~8.0 oz. First published in Britain, this colorful volume celebrates tattooing as an art of "delight, imagination, adventure and unusual creativity," in the words of Wroblewski, an English photographer who was first tattooed when he was 15. His pictures show many kinds of tattoos, including elaborate tattoos on punks (often on their scalps), classic American tattoos ("Mom" and girlfriends' names), tattoos worn by Maoris and people in Southeast Asia. In his informative essay, Wroblewski traces the history of tattoos, from the first evidence of its use on Egyptian mummies, dating from around 2000 B.C., through tribal popularity in Indonesia and Polynesia (the word derives from the Polynesian word tatau, to the extensive "subculture" of today. While many of these photographs will shock and disgust, some will be considered artas the wearers and tattooers wish. Copyright 1987 Reed Business Information, Inc.
Book Description: Calling on geometric forms found in Celtic monuments and manuscripts, this crafter�s companion presents basic design principles and step-by-step instructions for plotting out and drawing lines, twists, braids, and knots in the ancient Irish tradition. With lessons that can be applied to a multitude of arts and crafts�from needlework and woodworking to decorative painting�this instructional guide unravels the secrets to creating intricate Celtic knot work. Offering increasingly intricate designs with the addition of lines and new textures, artisans of any skill level will revel in the endless archive of original patterns provided in this sourcebook. 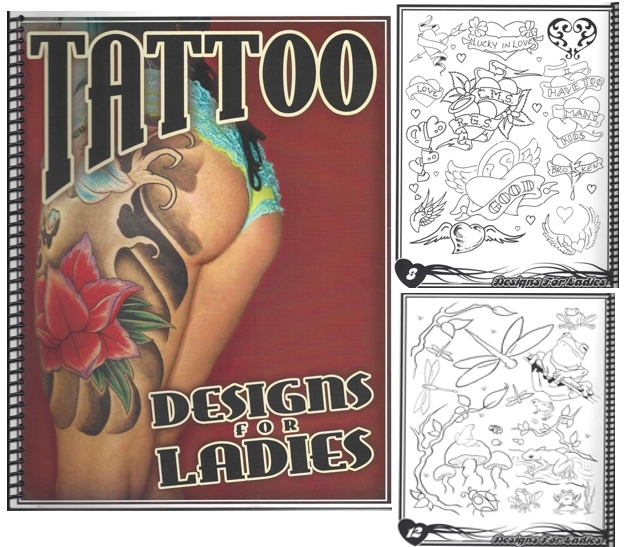 Book Description Presenting appealing and high-quality designs, this collection of tattoo artwork includes an extensive breadth of styles�including fantasy, Celtic, pagan, gothic, sacred, oriental, and mythical. Whether used individually, in combination, or as inspiration for original designs, this resource provides designs ideal for personal expression. From dancing dragons and Aztec Indians to fairies and flowers, this guidebook is a perfect companion for anyone with an interest in tattoos. Hardcover: 256 pages Product Dimensions: 6.6 x 5.9 x 1 inches Book Description: Tattoos are no longer unusual or uncommon; they are now an undeniable element of mainstream style and fashion. But tattoos are expensive and, more importantly, permanent; so choosing an image is a very big decision. Here to help is 500 Tattoo Designs, a vast reference library of popular tattoos. Neatly organized by theme, the clearly executed line drawings cover every conceivable subject area � historical and traditional to modern, from tribal imagery of native American Indians, Japanese and Chinese characters, arcane hieroglyphics to gothic skulls, Celtic amulets, and more. The book also features body positioning hints for specific designs, a discussion of color dynamics, and notes on health and safety. Whether you want to show off your design or conceal it, this book is packed with hundreds of possibilities. Book Description The history, mythology, and composition of angels, cherubs, fairies, pixies, and sprites are detailed in this handbook of fairy patterns. More than 72 fairy patterns for all mediums are featured, including dragonfly, sugar plum, and woodland fairies. The physical features of fairies and fairy backgrounds are examined in depth, including instructions for face and body painting that apply to all fairy re-creations. Comprehensive descriptions of different types of fairies accompanied by their folk histories provide a useful context for all fairy enthusiasts. American tattoo master Sailor Jerry Collins of Hawaii is best known for his remarkable tattoo designs, blending the fluidity of Asian motifs into classic American tattoo imagery. Until now, most of Sailor Jerry's work has been controlled by a handful of collectors, seen only at museum or art gallery exhibitions or in short-run, self-published books. Here is a sizeable portion of Sailor Jerry's stencils, the newest tattoo collectible, spanning his tattoo career, from the 1940s to the early 1970s. The basic line work of hundreds of his staple and surprisingly beautiful designs-pin-ups, roses, bluebirds, hearts, and banners, and Jerry's infamous military/political cartoons. The stencils themselves were handcut in celluloid, vinyl or acetate sheets by the master himself for use during his day-to-day thriving tattoo trade in downtown Honolulu. They are, in the best sense, permanent tattoos carved in plastic, enduring through time. In their original condition, most carry residual charcoal dust from their last use. All are signed by Jerry with one of his several distinctive signatures. This is the only book of its kind-a workbook for artists, and a design catalog for folk art historians. 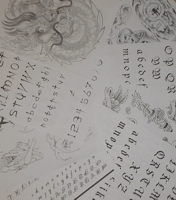 The value of the stencils is included, along with descriptions of stencils and their usage and a glossary of tattoo terminology. Sailor Jerry Collins of Honolulu, Hawaii, is arguably the greatest tattoo artist of the 21st Century. His best-known contributions are the now classic designs . . . fat round roses, plump pin-ups, and scathing military/political cartoons. Now, in a second volume, more of his great stencils are reproduced. Hand-cut, hundreds of basic line works are printed here for the first time. The pages are perforated to make it easier for today's tattoo artist to display the work of this master. 26 Page Sketchbook containing numerous Letter/Fonts, Sketches of Suns, Hearts, Butterflies, Flowers, Skulls and much much more! S"Step by Step, Beginning to End Tattooing". 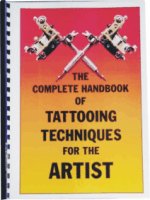 This 81 minute How to Tattoo instructional VHS is intended for the beginning/early tattooist or apprentice. Video contains easy to understand instruction & information on the following topics: 1) Preventing Cross-Contamination, 2) Loading the Machine, 3) Skin Prep, 4)Applying the Design or Transfer, 5) Outlining the Design, 6) Shading (Wash Effect), 7) Working on the Shoulder, 8) Color Piece & 9) Outlining & Coloring the Design. "Step by Step, Beginning to End Tattooing". This 81 minute How to Tattoo instructional DVD is intended for the beginning/early tattooist or apprentice. Video contains easy to understand instruction & information on the following topics: 1) Preventing Cross-Contamination, 2) Loading the Machine, 3) Skin Prep, 4)Applying the Design or Transfer, 5) Outlining the Design, 6) Shading (Wash Effect), 7) Working on the Shoulder, 8) Color Piece & 9) Outlining & Coloring the Design. 8 Volume VHS Set: If you're planning to Apprentice, you will find that these professionally produced instructional tapes give you a quality jump start to that career. VOL. 1 INTRODUCTION TO TATTOOING, VOL. 2 MACHINE MAINTENANCE & TUNING, VOL. 3 BLACK & GREY SHADING, VOL. 4 TATTOO RESTORATION, VOL. 5 TATTOO COVER-UP, VOL. 6 MAKING TATTOO NEEDLES, VOL. 7 BLOODLINE TATTOOING, VOL. 8 MAKING & USING MAG SHADERS. See below for individual video tapes/dvd's from this set. 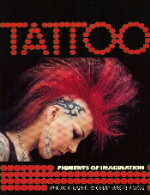 Apprentice LEARN TO TATTOO 8 Video Collection (DVD) NOTE: MAG SHADER IS OUT OF STOCK, THIS DVD WILL BE SUBSTITUTED WITH 2 OTHERS. 8 Volume DVD Set: If you're planning to Apprentice, you will find that these professionally produced instructional tapes give you a quality jump start to that career. VOL. 1 INTRODUCTION TO TATTOOING, VOL. 2 MACHINE MAINTENANCE & TUNING, VOL. 3 BLACK & GREY SHADING, VOL. 4 TATTOO RESTORATION, VOL. 5 TATTOO COVER-UP, VOL. 6 MAKING TATTOO NEEDLES, VOL. 7 BLOODLINE TATTOOING, VOL. 8 MAKING & USING MAG SHADERS. Very Important Note For DVD Users: These DVDs are made using the "DVD -R" standard. If your DVD Player cannot play this standard, do NOT order these. (Order VHS Tape Instead!). See below for individual video tapes/dvd's from this set. The "Advanced Tattoo Seminar Collection" is a three (3) tape series on Outlining, Shading and Coloring a large shoulder piece. The imparted knowledge assumes that the student has a good background in the Art of Tattooing, or has seen our previous Apprenticeship Series and is already using professional equipment. This seminar covers in great detail all of the nuances of working on large pieces. Everything you need to know about maintaining your large and complex outline, adding dimension, blending color, and planning a large piece is thoroughly covered in this Seminar Set. See below for individual video tapes/dvd's from this set. The "Advanced Tattoo Seminar Collection" is a three (3) tape series on Outlining, Shading and Coloring a large shoulder piece. The imparted knowledge assumes that the student has a good background in the Art of Tattooing, or has seen our previous Apprenticeship Series and is already using professional equipment. This seminar covers in great detail all of the nuances of working on large pieces. Everything you need to know about maintaining your large and complex outline, adding dimension, blending color, and planning a large piece is thoroughly covered in this Seminar Set. Very Important Note For DVD Users: These DVDs are made using the "DVD -R" standard. If your DVD Player cannot play this standard, do NOT order these. (Order VHS Tape Instead!). See below for individual video tapes/dvd's from this set. Volume 1 from the "Apprentice LEARN TO TATTOO" Series. Approximately 48 minutes. Volume 1 from the "Apprentice LEARN TO TATTOO" Series. Approximately 48 minutes. Very Important Note For DVD Users: These DVDs are made using the "DVD -R" standard. If your DVD Player cannot play this standard, do NOT order these. (Order VHS Tape Instead!). Volume 2 from the "Apprentice LEARN TO TATTOO" Series. Approximately 33 minutes. Volume 2 from the "Apprentice LEARN TO TATTOO" Series. Approximately 33 minutes. Very Important Note For DVD Users: These DVDs are made using the "DVD -R" standard. If your DVD Player cannot play this standard, do NOT order these. (Order VHS Tape Instead!). Volume 3 from the "Apprentice LEARN TO TATTOO" Series. Approximately 33 minutes. Volume 3 from the "Apprentice LEARN TO TATTOO" Series. Approximately 33 minutes. Very Important Note For DVD Users: These DVDs are made using the "DVD -R" standard. If your DVD Player cannot play this standard, do NOT order these. (Order VHS Tape Instead!). Volume 4 from the "Apprentice LEARN TO TATTOO" Series. Approximately 47 minutes. Volume 4 from the "Apprentice LEARN TO TATTOO" Series. Approximately 47 minutes. Very Important Note For DVD Users: These DVDs are made using the "DVD -R" standard. If your DVD Player cannot play this standard, do NOT order these. (Order VHS Tape Instead!). Volume 5 from the "Apprentice LEARN TO TATTOO" Series. Approximately 30 minutes. Volume 5 from the "Apprentice LEARN TO TATTOO" Series. Approximately 30 minutes. Very Important Note For DVD Users: These DVDs are made using the "DVD -R" standard. If your DVD Player cannot play this standard, do NOT order these. (Order VHS Tape Instead!). Volume 6 from the "Apprentice LEARN TO TATTOO" Series. Approximately 38 minutes. Volume 6 from the "Apprentice LEARN TO TATTOO" Series. Approximately 38 minutes. Very Important Note For DVD Users: These DVDs are made using the "DVD -R" standard. If your DVD Player cannot play this standard, do NOT order these. (Order VHS Tape Instead!). Volume 7 from the "Apprentice LEARN TO TATTOO" Series. Approximately 33.5 minutes. Volume 7 from the "Apprentice LEARN TO TATTOO" Series. Approximately 33.5 minutes. Very Important Note For DVD Users: These DVDs are made using the "DVD -R" standard. If your DVD Player cannot play this standard, do NOT order these. (Order VHS Tape Instead!). Volume 8 from the "Apprentice LEARN TO TATTOO" Series. Approximately 35 minutes. Volume 8 from the "Apprentice LEARN TO TATTOO" Series. Approximately 35 minutes. Very Important Note For DVD Users: These DVDs are made using the "DVD -R" standard. If your DVD Player cannot play this standard, do NOT order these. (Order VHS Tape Instead!). Volume 9 from the "ADVANCED Apprentice LEARN TO TATTOO" Series. Approximately 40 minutes. This Video is 1 part of the "Advanced Seminar" which is a 3 DVD series on Outlining, Shading and Coloring a large shoulder piece. The imparted knowledge assumes that the student has a good background in the Art of Tattooing, or has seen our previous "Complete Apprenticeship" Series. This seminar covers in great detail all of the nuances of working on large pieces. Everything you need to know about maintaining your large and complex outline, adding dimension, blending color, and planning a piece this large,is thoroughly covered in this Seminar. Volume 9 from the "ADVANCED Apprentice LEARN TO TATTOO" Series. Approximately 40 minutes. Very Important Note For DVD Users: These DVDs are made using the "DVD -R" standard. If your DVD Player cannot play this standard, do NOT order these. (Order VHS Tape Instead!). Volume 10 from the "ADVANCED Apprentice LEARN TO TATTOO" Series. Approximately 36 minutes. This Video is 1 part of the "Advanced Seminar" which is a 3 DVD series on Outlining, Shading and Coloring a large shoulder piece. The imparted knowledge assumes that the student has a good background in the Art of Tattooing, or has seen our previous "Complete Apprenticeship" Series. This seminar covers in great detail all of the nuances of working on large pieces. Everything you need to know about maintaining your large and complex outline, adding dimension, blending color, and planning a piece this large,is thoroughly covered in this Seminar. Volume 10 from the "ADVANCED Apprentice LEARN TO TATTOO" Series. Approximately 36 minutes. Very Important Note For DVD Users: These DVDs are made using the "DVD -R" standard. If your DVD Player cannot play this standard, do NOT order these. (Order VHS Tape Instead!). Volume 11 from the "ADVANCED Apprentice LEARN TO TATTOO" Series. Approximately 30.5 minutes. This Video is 1 part of the "Advanced Seminar" which is a 3 DVD series on Outlining, Shading and Coloring a large shoulder piece. The imparted knowledge assumes that the student has a good background in the Art of Tattooing, or has seen our previous "Complete Apprenticeship" Series. This seminar covers in great detail all of the nuances of working on large pieces. Everything you need to know about maintaining your large and complex outline, adding dimension, blending color, and planning a piece this large,is thoroughly covered in this Seminar. Volume 11 from the "ADVANCED Apprentice LEARN TO TATTOO" Series. Approximately 30.5 minutes. Very Important Note For DVD Users: These DVDs are made using the "DVD -R" standard. If your DVD Player cannot play this standard, do NOT order these. (Order VHS Tape Instead! ).